There once lived a pooch mini in stature but maxi in attitude. He patrolled his yard with vigour, scrutinizing every nook and cranny for sly lizards set for a ground assault of the yard or the seemingly innocent passerbys clearly plotting sinister activity. But even this ceaseless surveillance was of little challenge for such an astute mind and his cheetah-like athleticism. Thus his clueless caregivers were compelled to find new avenues for stimulation and physical exertion. The institution of two walks, one in the morning and the other as the sun slowly took its leave in the afternoon, was certainly a welcome addition to the daily regime but there was still something lacking; something free but also socially engaging, an opportunity to connect with the community. Just then it struck the family like a lightning bolt in a ferocious summer storm but with far less destruction. A dog park, oh yes, Lentil will frequent a local dog park. It was pure genius, new scents, refreshed daily by fellow consumers; wide open spaces to traverse; a myriad of potential new friends and different surrounds to investigate. But just then, as all were liberally giving and receiving pats on the back, a Google search revealed a lurking dilemma. 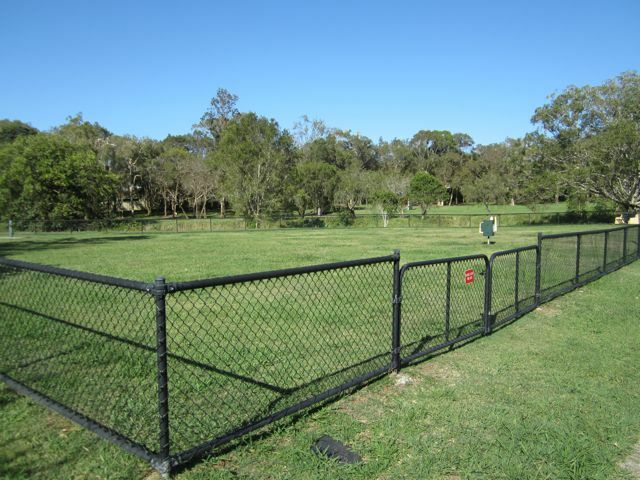 It seemed that in the Wynnum-Manly locale there existed not one, not even two but three prospective parks, each with their particular foci, which rendered a long list of both pros along with some not so pros. It became blatantly clear that for this little story to know a happily ever after ending there would have to be a survey, detailed and extensive, of each facility. Thus the mission began. Day one saw a visit to Elanora Park, Granada St, Wynnum. This park came with celebrity, featuring in many park reviews and even some television programs. Neighbouring the mangroves (not such a pleasant feature at dusk when the sandflies and midges come out to feast) and parallel to a mangrove boardwalk, this fully fenced and dual gated park stretches over 20,560m2. It supplies all the standard facilities, bins, poo bags, taps, some trees for shade and an occasional seat. Strangely the undercover tables and chairs sit outside the dog park, whilst the alleged playground seemed to be hiding upon our visit, presumably, it is somewhere? 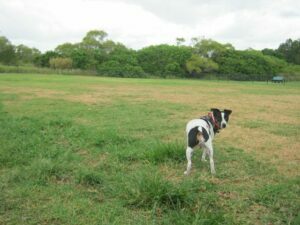 The Elanora Dog Park is enormous, stretching as far as the eye can see, well almost. 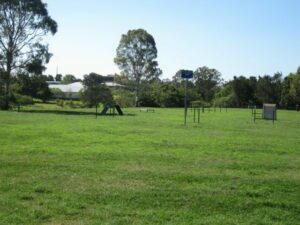 Towards the centre of the space is an agility area, housing several apparatus the dogs can use for training and recreational purposes. Despite hearty encouragement Lentil refused to try, preferring to ‘scent’ the area over sampling its wares. Feeling optimistic about this new space we released the beast. Well that was a mistake. It seems two jelly-like legs, linked to sedentary heart and lungs are no match for four low-set, sprinter-like legs and an athletic body. We realized then that Lentil didn’t require the agility course because he had all the necessary training he may ever require evading his family. So as enticing as an area like this appeared, we quickly realized that it was just too big for our little Lentil, virtually swallowing him with space and rendering us powerless to contain or collect him. Rather this park looked ideal for larger, athletic and working type dogs, as well as those that are well trained and obedient. Thus with tail, figuratively speaking, between our legs we began the hunt for a smaller area, which we found rather quickly at Stannard Rd, Manly West. 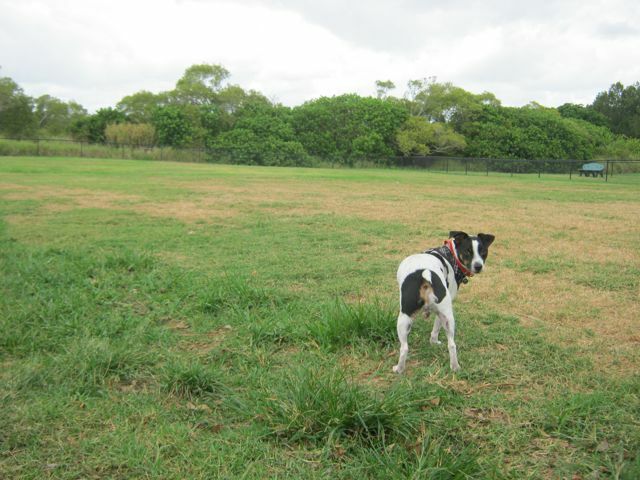 The 1,167m2 off-leash area sits parallel to Stannard Rd and on the edge of the 28,200m2 of the park greater. The park has a playground, plenty of trees for shade and is divided by a bike path. The dog area, however, is quite the contrast. It is fully fenced, with two single gated entries, a bin, poo bags, two benches, a tap and a few scatted trees but the obvious difference is size. This park is not for the large or working dog types. Nor is it for the dog that enjoys a hearty game of fetch or to stretch their legs out into a sprint, and sitting so close to a busy road also means owners must be vigilant with restraining their pooch/s and any apparatus they may employ for games, such as balls and Frisbees. Now whilst Lentil is on the smaller side of the dog-size scale he does enjoy a run and needs an array of potential mates in which to play. Unfortunately when we visited two German Shepherds had just left and there were no other dogs in sight. There wasn’t much shade about either and from experience we knew that Lentil wouldn’t seize the opportunity to investigate by himself. Furthermore, upon reflection, we don’t believe the size of the park would comfortably accommodate many dogs at a given time and so we lamented that Stannard St Dog Park was just too small for our energetic and social Lentil. Could there be a park that wasn’t too big but then again wasn’t too small; a park that was just right? Enter Bill Lamond Park, 34 Andrew St, Lota (although I’d say it is more the corner of Whites Rd and Andrew St). Nestled amongst the park proper is 4,483m2 of fully fenced pooch freedom, separated into a smaller area for the more petite breeds and a larger space for those that are ‘big limbed’, both accessible by a cemented path. 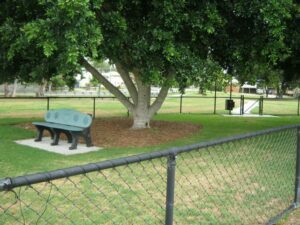 The larger dog park offers an undercover-seated area with three benches; water taps for the dogs and a bubbler for humans, as well as a few scattered plastic seated benches for spectators covered by trees. There’s also a bin and a poo bag dispenser. The smaller area has 2 bench seats, one shaded by trees; a bin and poo bags but presently there is no tap. All benches have plastic seats, which are ideal for dogs that like to jump onto them, as they don’t fall through the slates. 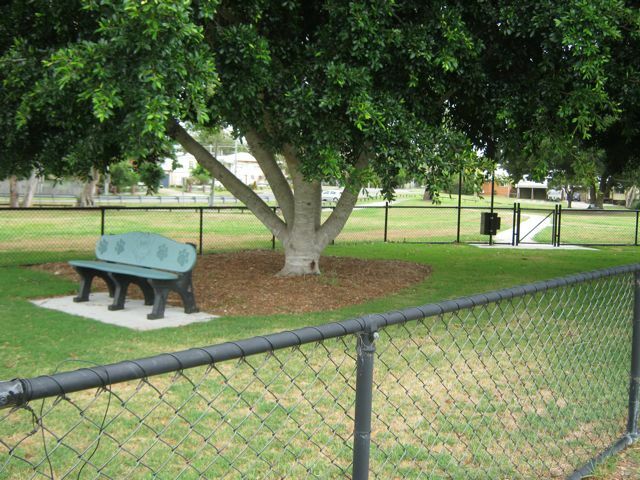 The general park has BBQ facilities, a basketball half-court, playground and picnic areas. Soccer fields sit parallel to Andrew St, which is the safest street in which to park (we parked off Whites Rd, which proved rather dangerous reversing onto upon leaving). When we visited there were many dogs around of various sizes so Lentil quickly found his gang. There’s plenty of space for a solid run, sprint, game of fetch or simply to engage in a little sniff and scent without losing all control of your dog. There’s also opportunity for human park-goers to meet new friends within the confines of the undercover area, which is a common feature of most dog parks. So with Lentil racing around and his people eagerly observing, occasionally chasing him (be that rather carefully as there can be rogue number twos lurking amongst the grass) and meeting new friends we rejoiced in having found our 4-legged nephew an ideal dog park not too far from home. It took some time, energy and occasional drama but for Lentil, Bill Lamond Park is just right!